For a Week I stayed at a building named Ganga Vihar, at Marine Drive. This was almost a break from the traffics of the suburban Mumbai. 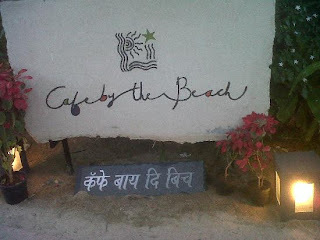 I went to this place called Cafe at the Beach, at my favorite "H2O- Water Complex". This Cafe is one of its kind in South of Mumbai. 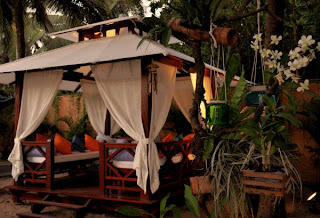 It is very serenely placed over the most clean part of Chowpatty, and beautiful candles and lampshades light up the place romantically in the evenings. The menu is quite extensive for a "Cafe", but very delicious food. The Mojito and Margaritas are very decorative indeed. Gives you a perfect BEACH feeling. What we did was Para-sailed and chartered a Jet Ski, were drenched in salt-water and then sat at the Cafe for a cool breeze. The waiters also are well dressed in their three-quarter pants and funky floral shirts. So, this is exactly where we sat. Isn't it beautiful !